Web Development can be simply stated as a set of tasks which is associated with the development of a website. It includes the process of building and deploying the website. 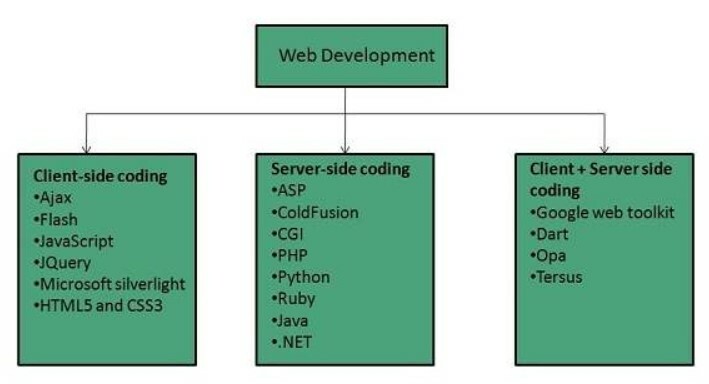 The Web Development mostly includes website building, network security, hosting, and maintenance. Web Development deals with coding and writing part dealing with the non-design aspect of the websites. It includes the creation of simple and plain web pages to complex web-based applications, e-commerce websites, and social networking websites. The commonly used name for Web Development among the developers is Website Development. What are the data to be uploaded to the website? Where will the website be hosted? How to make the website SEO friendly? Make a website load quickly? How to make the website secure? HTML: HTML stands for HyperText Markup Language. It is the basic programming language which is used for making static web pages. The basic layout of the website is defined using HTML. It is used to display text, images, and other resources. It consists of a head, body and a footer section. CSS: CSS stands for Cascading Style Sheet. It describes the formatting of pages made with HTML. CSS and HTML go hand in hand. While HTML defines the layout of the web page, CSS is used for styling it. Alternatively, CSS can also be used for styling web pages made using XML, SVG, and XUL. A separate CSS file can be created which is linked with the main HTML document. The CSS file is saved using the .css extension. BOOTSTRAP: It is a front-end development framework. It makes the development of front-end easier with pre-defined tools. It consists of HTML and CSS defined templates which makes the web page responsive in various screen size. Web pages created using Bootstrap templates offer interactive and beautiful looking pages with customizable menus, buttons and other interface components. Deciding Purpose: The main purpose of the website should be understood well before writing the codes of it. Planning: Once the purpose is decided, the developer should plan the steps for developing the website. Designing: First step in the website development is deciding how the website should look and designing it to be such. Content: The content which should be placed on the website should be decided and aligned properly. Building: Remainder part of the website should be coded for both client and server side. The database should be created based on the data which will be stored. Testing: The most important part of the development process is the testing part. The website developed should be tested against all the cases where it can fail. This step can be said to be destructive rather than a constructive step. It aims at breaking the website at some point for finding errors in the coding. Hosting: Once the website is ready to be made online, a suitable hosting platform is found and the website is uploaded on to the internet. Maintainance: More errors can be found once the website goes live. The developers should handle the website properly and efficiently.